Wake up and dream: Amma's message for the new year. Amma's message for the new year. 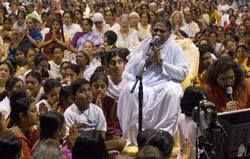 We are all very happy that another New Year is upon us,” Amma said. “Happiness is good for the health of the body and the mind. Our goal is to always be happy. Everyone should always be happy and rejoicing—just like a small child. That is Amma’s desire. Human beings are most happy in childhood. But the time considered as “childhood” is ever decreasing. Previously, one was considered a child until he was eight or nine. But today the innocence and pleasantness associated with childhood is fading faster and faster. Childhood these days is filled with seriousness and tension. When our desires are fulfilled, when things go according to our plans, we experience happiness—but it is only temporary. Many people celebrate the New Year by setting off fireworks or celebrating in the ballroom of a beautifully decorated five-star hotel, exchanging New Year greetings and dancing and singing fully intoxicated. A large percentage of people then return to their home or tension-filled office without retaining even the tiniest amount of happiness or peace. What then is the point of the happiness experienced while drinking or sitting at the bar of a five-star hotel? Real happiness is something that can be experienced at any time and in any place—in family life, social life, at work and in the mind. That should be our goal. To attain this, our mind should be full of love. May this New Year fill our hearts with love and gratitude. When we express a desire and it does not get fulfilled, we start questioning life and why it has not met our expectations. We become depressed. But there is no law that all of our desires should be fulfilled. We should understand that life gives us what we need and not necessarily what we want. It follows its own wisdom, which is often incomprehensible to our gross minds. We should learn to accept situations in life. This attitude of acceptance is the secret to happiness. As we enter 2008, let us pray together, “O Paramatman, let there be no wars, violence or natural disasters this year. Let there be no death due to starvation or lack of medical care. Let there be no children who are unable to continue their studies due to poverty. Let the music of peace and harmony be heard everywhere. Just as we decorate our houses and surroundings with lights, let our heart remain effulgent throughout the year with love and compassion." Excellent blog. Thanks for all the wonderful posts, I can certainly feel connected with almost all of your recent posts.